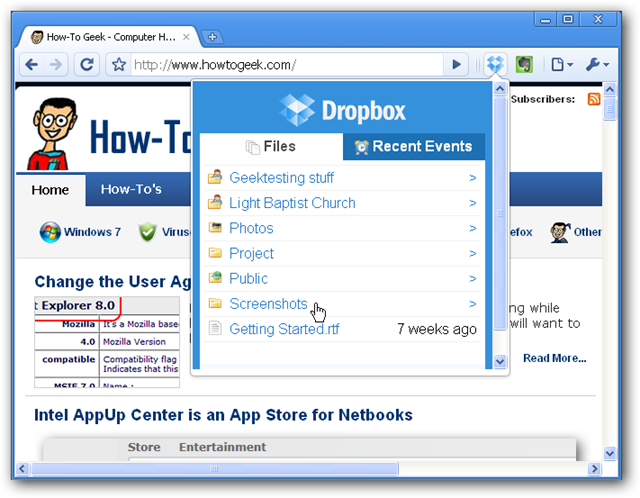 Would you like to quickly access your Dropbox files while you’re browsing or using web apps in Chrome? 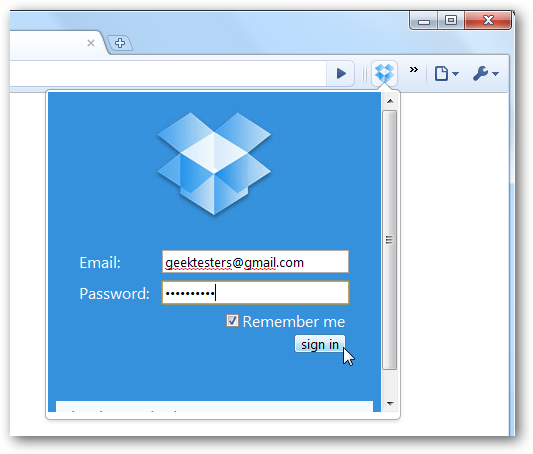 Here’s a neat extension that can help you access your Dropbox quickly while in the browser. 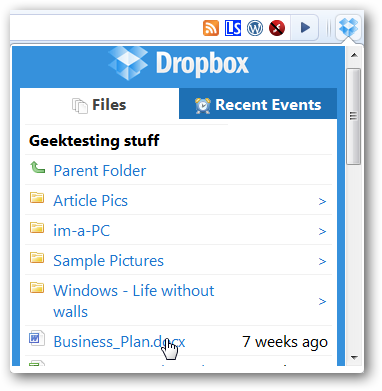 To start using Dropbox from Chrome, head over to the DropBox extension page and click Install. Once the extension is installed, click the new Dropbox logo in your toolbar, and sign in with your standard Dropbox account. Make sure to check Remember me so you don’t have to enter your information each time. Now you’ll see all of your Dropbox files and folders right there in the overlay menu in Chrome. Click your folders to open and view what’s inside, or click a link to a file to download or open it directly. Images will open in a new tab in Chrome, but documents and most other files will download. Just click the file to download, and it’ll immediately start downloading. You can also view recently changed and added files in the Recent Events box. This is especially great if you’re collaborating on a project and need to see if your shared files have been recently changed. 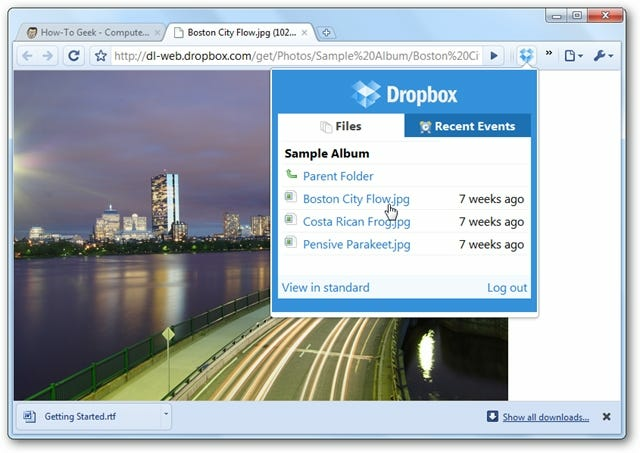 Now, no matter what site you’re visiting, you can quickly access your Dropbox files. 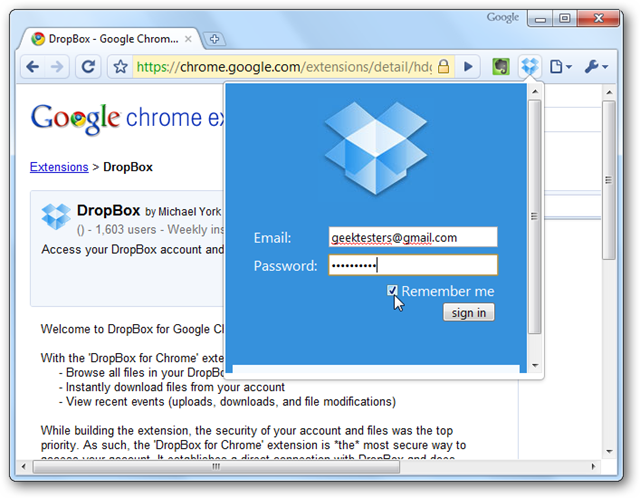 This can also be a great way to keep up with a second Dropbox account; if you have one Dropbox account linked to your computer, you could keep a second account linked in Chrome with this extension. Portable applications make it easier to use your favorite programs from anywhere, but unfortunately there’s no portable version of Dropbox. But, you could install this extension in Portable Chrome so you could still easily access Dropbox no matter what computer you’re using. To get started with Portable Chrome, check out our article on how to get it installed and running from your flash drive. 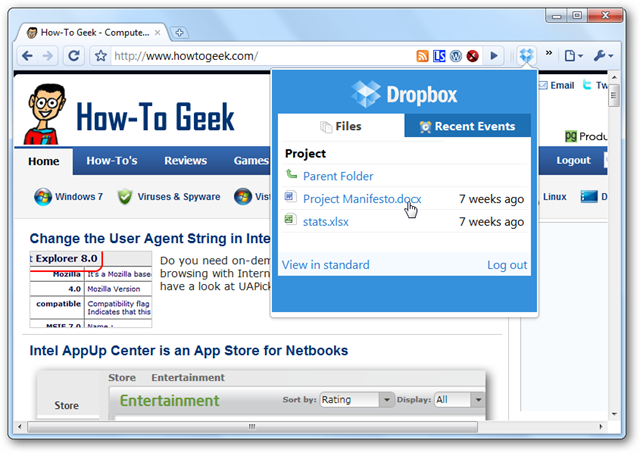 Now run Portable Chrome and install the DropBox extension in it as above. Log as before, and make sure to check the Remember me box. Now, whenever you run Portable Chrome, you’ll never be more than a click away from your Dropbox no matter what computer you’re using. Your account will stay logged in even if you use it on another computer. 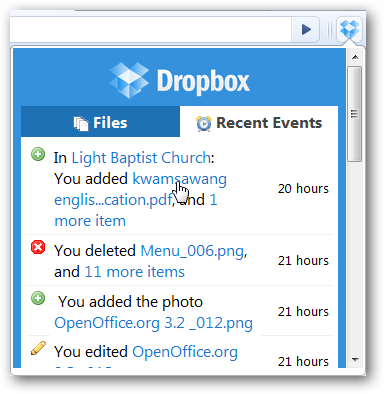 If you use Dropbox regularly to save files and collaborate with others, this extension can make it much easier to use Dropbox. Even though this extension is actually just displaying the Dropbox mobile site, it’s still a handy tool since it is much quicker to use that actually logging in to the normal site. The extension is amazingly responsive, and may be the quickest way you can find a file or view recent events in your Dropbox. 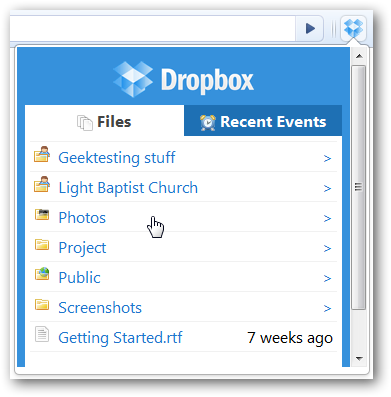 And if you regularly collaborate with others in Dropbox, check out our article on Using Shared Folders in Dropbox. It has some tips and tricks that can make it easier to keep up with changes in your shared folders.